Welcome to the Ethical Hacking Online Course. CyberProtex students get 24/7 access to the demos of how to use some of the hottest tools. There are a multitude of videos to watch at your convenience. If you have any questions about any of the labs, send us an email and we will explain in greater detail. The CyberProtex "Ethical Hacking" Course follows the Department of Homeland Security (DHS) Workforce Framework. The Framework is the foundation for increasing the size and capability of the US cybersecurity workforce. 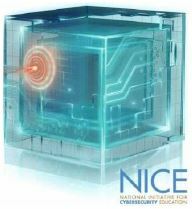 CyberProtex has partnered with the Department of Homeland Security to implement the Workforce Framework through the National Initiative for Cybersecurity Education (NICE). A listing of modules for the Ethical Hacking course is shown below.